Enter the diameter or radius of the bolt circle. 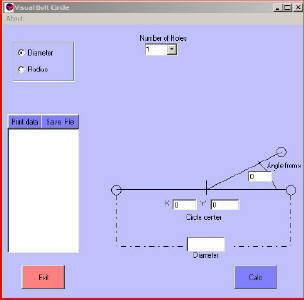 Select radius or diameter via radio buttons. The angle off x axis is the amount in degrees that the bolt is rotated about its axis. 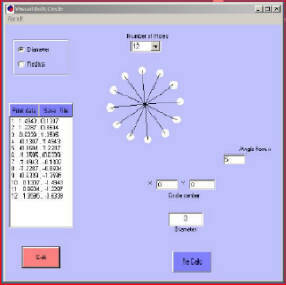 The bolt circle can also be offset from another coordinate system. Enter the offset in the x or y boxes. Select number of holes from drop down. Listing can be saved to a file . Browse to folder and enter file name and select SAVE. 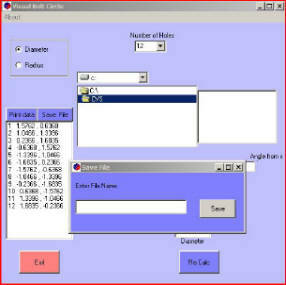 File will be saved with a TXT extension, which can be opened with Notepad. File is a spaced delimited listing with no headers that can be uploaded to a machine with a little editing.